Our certificates come in at the inexpensive price of $4.00 per certificate. One book per order is required only if you do not have a book. You must have an approved book that match certificate. With 10 certificates or more book is included with price. Additional books are $6.00 each. English or Spanish. Note: All orders include one book in English and priority handling and postage for $11.99. No COD. Credit Cards are accepted. Click here to see a Sample Certificate. Food Handler certificates are required by Florida law for all employees. We provide you with Florida approved food worker training programs and certificates. You as management / owner provide the training (Florida law does not require a written exam for food handlers). Director of operations for the National Restaurant Association – 5 years. Appointed U.S. Army Evaluator for the Philip A. Connelly Award Program in 2008 and 2013. 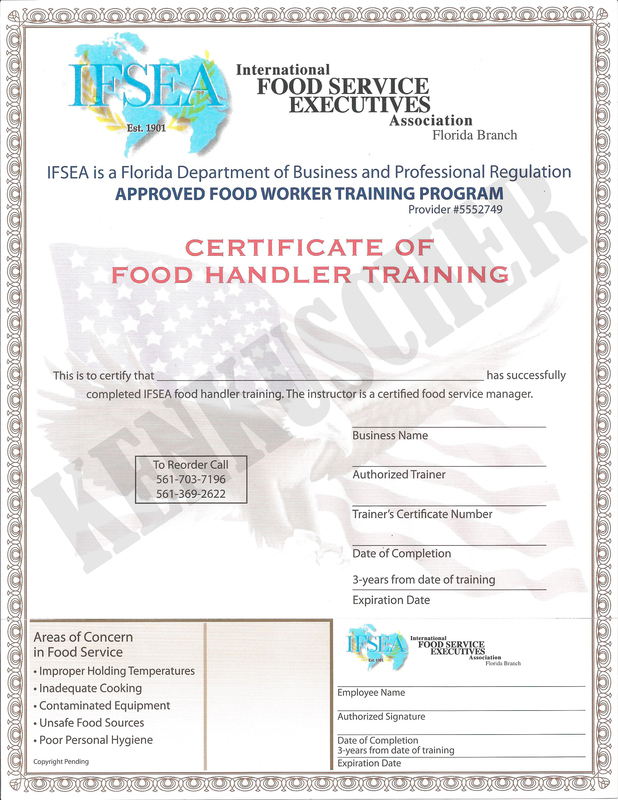 Besides being helpful in keeping you, your staff and most importantly your customers healthy a food handlers certificate is required by Florida law for all employees that are in the food industry. All food service employees must receive training on hygiene and food borne disease prevention, in addition to training on their assigned duties. The establishment has to train employees within 60 days of hiring. Each employee must receive a training certificate from a Florida approved training program every 3 years. To order your certificates: Call Ken Kuscher @ 561-703-7196.